Team tower works on building their interchangeable bins with the precision necessary to be able to have one bin fit into another. What a whirlwind of a week our High School Sustainability Leadership students had while they were here on Hurricane! The week kicked off with a discussion and solutions brainstorm for the worldwide problem of marine debris with our fabulous educational partners, The Rozalia Project. After getting our creative juices flowing we jumped right in to design and build solutions to real sustainability problems today. 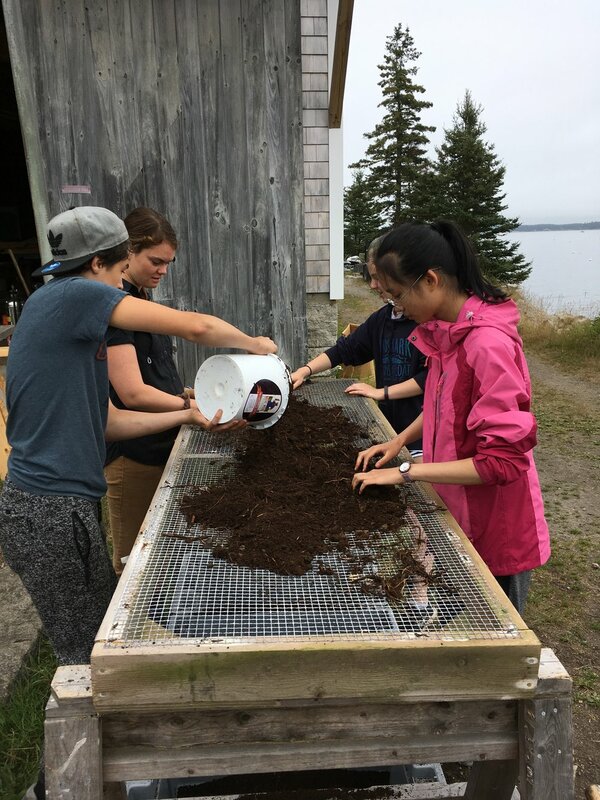 Over the course of the week the students inoculated logs with shiitake mushrooms and designed and built their own vertical pallet gardens and vermicompost bins. Our students for High School Sustainability Leadership were a dynamic and engaging team comprised of students from all over New England as well as six students who came to us from Alpha Educator, an international education center for students from China. Having this dynamic mix allowed students to compare how sustainability issues are being addressed in their home countries and states and learn from one another. As we try to move more in the direction of food independence on Hurricane, being able to sustainably garden has become a more pressing concern. Because there is so little soil on Hurricane and that which does exist is relatively nutrient poor, being able to rapidly produce high-quality organic input for our gardens is key. Hence, the students learned about vermicompost and made some of their own. Vermicompost is the product of using worms to process food waste. The worms, in our case Red Wigglers, eat the organic waste and then excrete nutrient rich castings, which can be used as agricultural inputs, or fertilizers. While we try to minimize food waste as much as possible on the island, some is always inevitable and composting is a great use for food scraps. After learning about the importance of composting, the benefits of vermicompost, and what worms need to thrive, the students split into three teams to design beautiful, as well as functional, worm bins. 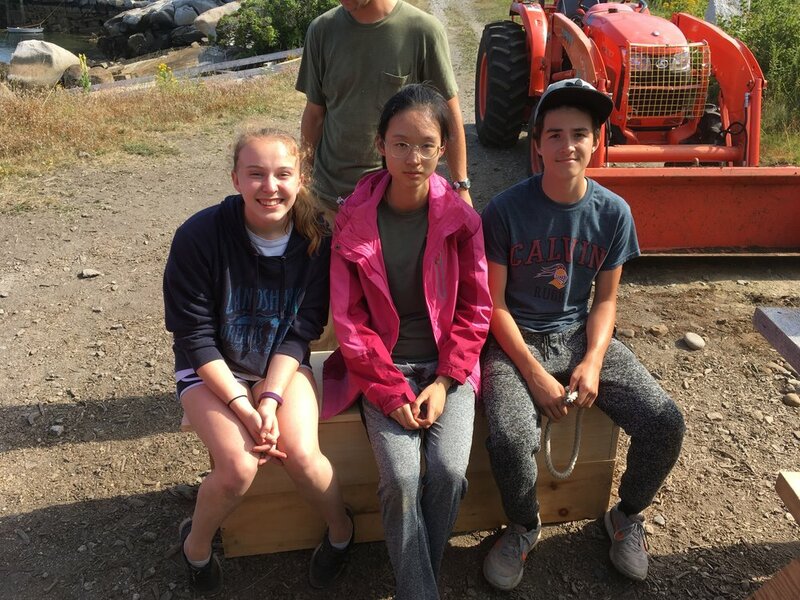 The three designs the students ended up building could be loosely classified as a big box design, a tower design, and a bench with a removable top in which the worms would live and work. 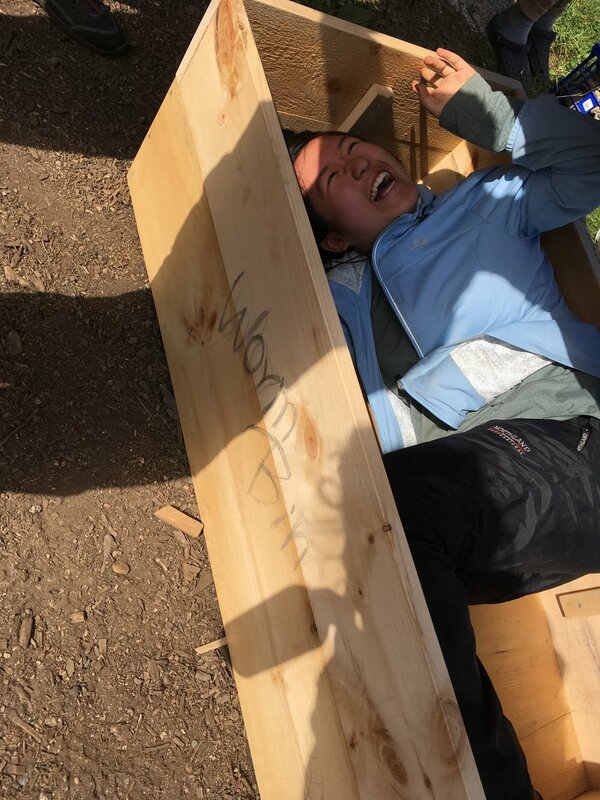 The students did the calculations of for how much lumber they would need and what other materials their bins would require and once all of the necessary materials had been acquired it was time to build. The “big box” team drilled, hammered, sanded and planed their box that was large enough to fit a human inside into existence. The bottom of this box has gentle gradient, which allows for the worm “juice,” the liquid runoff from the composting products, to run towards and collect at one end of the bin where there is a hole from which this compost tea can be collected and returned to the gardens of Hurricane. This insures that the worms don’t drown in too much liquid. As the worms work through their initial starting materials, team big box envisioned a method of casting harvesting in which the already composted material would be pushed to one end of the box and new food scraps would be added to the other end. The hungry worms will move towards the new food allowing the students to take the compost without fear of loosing their precious worker worms. Team tower had an elegant design, which consisted of two identical boxes that fit into one another each with a mesh bottom that was wide enough to allow moisture to run from one box to another and then finally into the base, but not so large that the worms would be able to pass from layer to layer. As compost juice flows into the base of the structure one is able to harvest it through an opening in the side. Because both of the bins are interchangeable new food scraps could be added to the uppermost bin while worms continued to compost those bellow. When it comes time to harvest these casting the bins can be swapped allowing the bin that had had the newer food scraps to be moved to the bottom while the bin with the fully developed castings is dumped out on to a tarp. Because worms are photosensitive, when exposed to sunlight when dumped out on the tarp they move downward within the soil allowing the top layers to be taken and used without taking the worms with you. Team bench scouted locations all over central campus keeping in mind sun exposure, accessibility to the galley, and where a bench was most needed and would be most frequently used by both island visitors and staff alike. After careful deliberation a site was chosen on the back deck on the wall of the infirmary because of its northwestern exposure and the fact that the raised up portion of the back deck would allow the bench to hang off the edge slightly and compost tea be collected from the bottom as needed. The bench is one open cavity inside, however, has a raised mesh bottom above the wooden bottom of the bench so that juices can flow through. Our High School Sustainability Leadership students left Hurricane confident in their abilities to identify the problems our world faces today and come up with creative sustainable solutions that will make the world a better place. The ability to see their ideas become a reality made what can often be an overwhelming task, living lightly on the earth, seem that much more achievable for the students of High School Sustainability Leadership 2017. Science Educator, Isabelle, and Teaching Assistant, Lilla, sitting on the finished worm composting bench on the back deck by the galley.